Church steeples, because of their height and key in-city locations, are bringing churches $25K, $50K and more yearly from telecom companies for cellphone arrays. Not only are church steeples desirable locations for the telecoms, but the churches, mosques and temples appear eager to buttress their incomes in a way that involves little effort and no cost. Protestant, Catholic and Jewish Synagogues contacted by this reporter and EMF health advocates across the nation mostly would not return calls and emails on the subject. Not returning an email was Joseph Zwilling, PR head, Archdiocese of New York. A few individual cases of cell towers in spires were confirmed. We learned that St. Marks Episcopal Church on Main st., West Hampton Beach, has leased its spire to telecoms. Rector Michael Ralph said the companies involved are AT&T and T-Mobile. He would not give the cost of the contracts nor length. Our next stop was measuring, with an Acoustimeter, the radiation being emitted from the spire as we stood across the street. It was near the top of the danger zone—measuring No. 14 on a scale that went from No. 1 (0.02 volts per meter) to No. 15 (6.00 volts). No. 14 was 4.5 volts per meter. We also visited the Westhampton Country Club across the street. Most rooms were below the danger level but one was at that level. Club officers and staff should hire one of the many services that check EMF. Susan Foster, medical researcher who has helped firefighters block cell towers on firehouses, said “Churches, synagogues and mosques are playing with the lives of people and not doing their research. President Ronald Reagan crippled EMF research when he defunded the wireless radiation research arm of the Environmental Protection Agency in the early 1980s, she said. The new 4G and 5G cellphone antennas work over much shorter distances than earlier antennas. Hundreds of thousands of new transmitting stations will be needed, and churches are a prime target of AT&T, T-Mobile, Verizon and the other telecoms. Church steeples have been sought as stations since the early 1990s, said California Watch, which merged with revealnews.org. There are 350,000 religious facilities in the U.S.—314,000 Protestant and Christian; 24,000 Catholic, and 12,000 mosques, temples and non-Christian. Residents of Fort Collins, Colo., in March 2016 blocked installation of a six-panel cell tower in the spire of the LifePointe Church. Residents said, “Like more than 100,000 times since 2004, a major cellular carrier once again was pushing for greater cell coverage for their network. While the approval process for new cell towers has come to be a slam dunk in the US, this time things would be different. 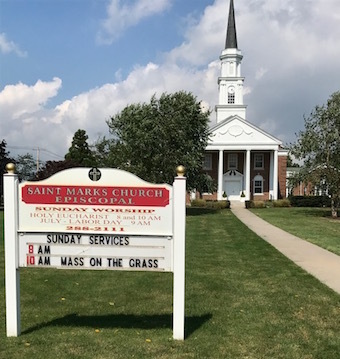 At issue were the potential health impacts from the cell tower’s close proximity to a residential community and Lesher Middle School, which lay 150 yards west of the church. Meanwhile, residents had uncovered more than 6,000 studies showing harm from electromagnetic radiation (EMR). All this coupled with the emergence of new science emboldened the community to speak out.